Interview with Globe and Mail 2014-02-28 | Ismaili.NET - Heritage F.I.E.L.D. 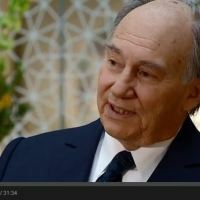 The Aga Khan, spiritual leader to the world’s 15 million Ismaili Muslims and an honorary Canadian, visited Canada this week to speak to a rare joint session of Parliament, and inspect the new Ismaili centre in Toronto, due to open this summer. He also sat down with The Globe and Mail’s Editor-in-Chief John Stackhouse for an hour on Friday. JS:You’ve been promoting the creation of parks around the world, from Cairo to Kabul to Delhi, and now Toronto. Why do parks matter to you? AK:When a public space is in a historic area or even in an ordinary area, the population from all backgrounds comes together. People from all ages, from different backgrounds, come together. It’s a space of immense social gathering. That’s part of civil society. It’s getting people to talk to other people informally in these environments. JS:You are celebrated as a champion of pluralism, and you refer to Canada as a global model of pluralism. What can immigrant communities draw from the Ismaili experience coming to Canada in the 1970s when your community was forced out of East Africa? AK:It wasn’t just the political system. It was the banking system. I reached an agreement with Prime Minister [Pierre] Trudeau and President [Jomo] Kenyatta. Another big factor was the role of Canada’s banks, Royal Bank, CIBC and Bank of Nova Scotia, which agreed to lend money to families and entrepreneurs with a financial guarantee from the imamat (his office). What is important is the notion that commercial banks will deal with whole communities as long as they’re not at risk. It’s a wonderful thing that they accepted the imamat’s guarantee. JS:What else can be learned by other immigrant communities? AK:Let’s be frank. The community had one thing. It was absolutely fluent in the English language. The fact that they were fluent in English meant they could adjust into Canadian society, to Canadian national life. This was true of the younger generation. The elder generation is less fluent. The second thing that played a big part is that the community has a structure, it has a constitution, it has consular bodies, it has people who have functions. It was not a disorganized community. It was a community that was facing disorganizational pressures. but itself, it had its own capacities. There was a structure that responded to needs. That structure had been set in place before the Uganda crisis. JS:You’ve said pluralism is a process, not a product. In terms of Canada’s process, what concerns are raised by Quebec’s Charter of Values? AK:Frankly, I haven’t read it, but if you’re asking me about the generic issue, I’d say there are two issues – one is the purpose of carrying religious identification. Is it a purpose that has an objective to proselytize, or is it personal conviction – and a sense of identification with one’s faith – that cannot be interpreted as proselytization? In the case of the Sikhs, for instance, they have a religious duty – and it has been accepted by many governments. Why is that an exception? Because it is seen as a requirement of their faith. JS:Is it different for facial coverings, because many see those as a barrier to communication? AK:That is more complicated because the history is probably more tribal. So depending on which part of the world the community comes from, they will wear different headdresses. There’s no common rule. It’s something that has to be looked at very carefully, to find a common denominator that is acceptable. JS:Like Canada, you’ve devoted much of your energy to Afghanistan, and invested there in things like hotels. Do you hope for stability any time soon? I think it’s going to be a little bit of a kaleidoscope, a mixed picture where various provinces will move ahead and others will find themselves with less forward movement. The conditionality of all that is the protection of civil society. I’m not convinced that is in place. JS:What does Afghanistan need most? AK:A fully trained police, police from the provinces, trained and perhaps led by training officers for a period, not necessarily Afghan training officers, for a transitional period. JS:Should the Taliban be at the table? AK:What is the nature of government that you want for your country? At present, the constitution does not allow for the country to become a theocracy. It is a civil society with space for faith. That’s the dividing line. That’s why I highlight the Tunisian example. Its constitution is based on a civil society. JS:The Taliban, among others, want to move backward in terms of rights, especially toward women. Is that a condition of peace? AK:Some people refer to it as Islamification. I can’t think of one single country where that has succeeded. The reason is the diversity within Islam, the different types of attitudes towards inheritance, towards zakaat. The attempt to bring a Muslim country that has a multiple of interpretations of Islam around one single interpretation of Islam has never worked. They may try to force it. That’s a different issue. I’ve never seen it work where it wasn’t followed by some form of dictatorial government. JS:Is the Ummah, the worldwide community of Muslims, more divided today than 30 years ago? AK:Yes and no. Demographically, no. In terms of the changing environment, very definitely yes. In simplistic terms, the invasion of Iraq eliminated a Sunni minority government in a Shia majority state. In Syria, you have a Shia minority government in a Sunni majority country. In Bahrain, you have a Sunni monarchy governing a Shia majority. These situations have become much more acute than before. JS:Is that because of borders and do they need to be rethought? AK:The first issue that comes up is equal opportunity. That is critical. No one can convince me that the Hazara are a community given equal opportunity in Afghanistan. Demography, access to opportunity, access to education, access to the financial system, ownership of land, all these issues come into play. What we are seeing today is a surge by many of these communities to reposition themselves. The dominant force is not there. When that disappears, everyone looks to reposition themselves. JS:That’s a polite way of saying there could be chaos. JS:Is that sorting itself out, or is it in the middle of what you call “extensive repositioning”? AK:Extensive repositioning, and I don’t think the forces at play are anywhere near their state of intentions. AK:There are so many countries trying to redesign their constitutions. If you’re addressing your constitution, one of the things you can do is refine your demography, you can rewrite the equality of opportunity, you can protect rights. Many countries I’ve worked in have done that. Tunisia is the most recent example. But India changed its constitution some years ago to protect the right of its minorities. That’s entirely legitimate. The reason being that any weak minority in a given country is a liability. JS:Do Iraq, Syria accept that? AK:Syria does. It’s a pluralistic society. It’s historically pluralist and that goes back centuries. If you look at the post-colonial experience, for the first 10 years everyone was running around trying to create a national identity. So you were stuck with a national language that was not entirely useless. You were stuck with economic competencies that were not entirely useful. That plays against the development of the country. JS:For Syria, is there reasonable hope its people can resolve this? AK:I don’t see anything to lead me to believe there is an outcome [that is positive]. It would seem [Bashar] al-Assad has to go. AK:That’s one of the things being discussed. But how realistic is it? There’s no point, in a situation like that, discussing non-negotiable issues. JS:Do you see that as non-negotiable? AK:It’s not my view [that matters]. It’s what is President Assad’s view. And what is the Russian view and what is the Iranian view. So I don’t see an outcome for the moment. JS:What is negotiable in Syria? AK:There was a concept that islands of peace could be developed, and that those islands of peace could be built around minorities, and would receive international guarantees, but that didn’t happen. AK:I don’t think the United Nations saw that as a real opportunity because the whole situation is so fractured. There’s something like 1,400 independent groups functioning in that state. So for the moment, it’s war. [b]One of the players in Syria is Iran. Is the new regime in Tehran trustworthy? I think civil society has had a much bigger impact than people think. When you have theocratic forces facing civil society, there has to be accommodation of some kind, and I think that’s what has happened. It may have been partially sustained by economic pressure but I don’t believe the economic pressure alone caused this to happen. That process is still fragile. Why?There are established forces in the country that have been there a long time. I think there is an intent to accommodate, which would be rational really. JS:In Egypt, should the Muslim Brotherhood be recognized as part of a pluralistic process? AK:The basic issue is what is the nature of governance that you want. In the Muslim world, that is particularly complex because faith and world are not separated. Where we have political parties that are faith-based, they are part of the real world. They are not only theocratic parties. They actually act in civil society, and the Muslim Brotherhood in Egypt is an example. There is a real difficulty in accommodating these individuals. In Tunisia, they decided it was a civil outcome they were all going to support. JS:You have a heightened sense of concern about the world. AK:Without a doubt, I am seriously worried. I think we are seeing new problems that originally looked to be local problems but now are becoming regional problems and regional problems that are becoming global problems. One of them is frustration with governments that have stayed in power too long and underperformed. Another, the Shia-Sunni divide is a serious one. It’s not one country called Ireland. It’s nine countries. That’s a lot of countries. So we have a serious problem there. I think we have a situation where new megapowers are coming up on the world screen. I’m thinking of China, and, from my point of view, predictability is a problem. If you’re looking at the global map and you’re asking what’s ahead, I find predictability with respect to China quite difficult. Their policy toward Africa has been very supportive. I don’t know where that will go in the next 10 years. To me there are more questions on the radar screen than there was a year ago. JS:You seem more hopeful about human development and the fight against poverty. AK:In individual situations, very definitely yes. There are a number of countries where wealth is being created. But it’s an uneven picture. Some countries have made bad judgments on education, bad judgments on resources. JS:So we should be more hopeful about economics than politics? AK:I see more rational foundations. If you go back to the ‘60s, how often could you have a rational debate about development? Everything was forced into ideology, into dogma. That’s not there any more.